Exploring sights near Johnson’s Island on those days off. Or is it off days? The field crew went exploring the vicinity of Johnson’s Island at their own risk during their days off this past weekend. This is their own account of their adventures. There has been a great deal of dinosaur activity on the island recently, which we believe may be linked to the recent volcanic eruptions in the area. We have been told they have been migrating to escape the lava flow, and as a result are highly violent and dangerous. 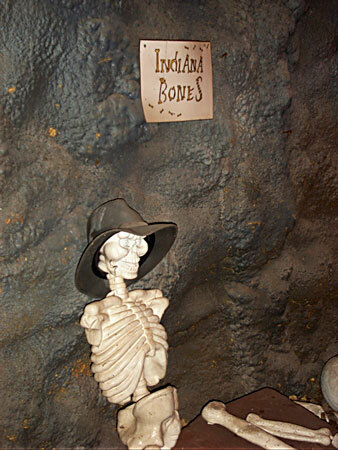 We encountered the remains of a famous archaeologist while exploring some hidden caves on the island. We had no idea that the final resting place of such an eminent scholar was on Johnson’s Island! We are very precise and have specific tools to aid us with every material encounter–even dinosaur bones, which technically fall under the field of paleontology. We may have discovered the actual reason why the dinosaurs vanished from the earth. 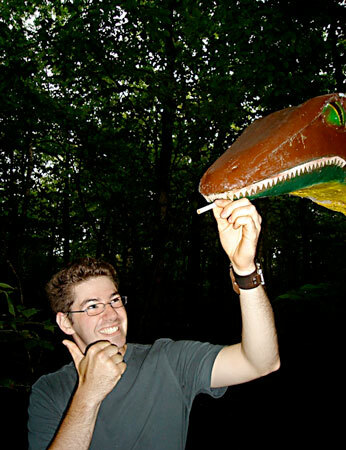 Here our crew chief is explaining the hazards of smoking to one of the doomed creatures. This entry was posted on Monday, June 30, 2008 at 6:37 am	and is filed under Off Site. You can follow any responses to this entry through the RSS 2.0 feed. Both comments and pings are currently closed.